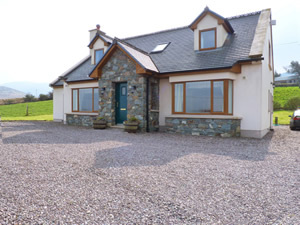 This delightful holiday home in a countryside setting is 11 miles from Killarney town set on its own grounds with a backdrop of the Kerry mountains. Tastefully furnished and decorated throughout with pine fixtures and fittings and an open plan interior design enjoying a south facing position. Each room is spacious with its own ensuite facilities. Central to all the attractions of Killarney and easy access to main road to the Ring of Kerry. The Gap of Dunloe and famous Kate Kearneys cottage and Moriarty's Irish Store and Restaurant..Shop 1 mile. Pub 3Ã‚Â½ miles. Restaurant 2 miles. Beach 16 miles. GF: lounge, lounge/kitchen/diner, utility room, 2 doubles 1 with ensuite shower room, bathroom with ensuite bathroom (shower over bath). FF: double with ensuite shower room, double with single with ensuite shower room, triple with ensuite shower room.Oil by meter read and electricity by meter read, wood burner with starter pack, linen and towels included, No Smoking, cot, high chair, dvd player, freezer, microwave, dishwasher, w/machine, dryer, freeview, hairdryer, welcome pack, fully enclosed garden, patio furniture, private off road parking. One pet welcome. Beaufort is family friendly self catering. Beaufort is at Lakes of Killarney, County Kerry.